Microsoft promises more feature-packed updates for Windows 10, the iPhone 7 rumor mill continues to swirl, BlackBerry releases its Hub+ apps on Android, Spotify targets its Release Radar, and more proof youngsters have it too good. Now that Windows 10 is no longer available as a free upgrade Upgrade to Windows 10 Right Now, Facebook Grows Even Bigger... [Tech News Digest] Upgrade to Windows 10 Right Now, Facebook Grows Even Bigger... [Tech News Digest] Your last chance to upgrade to Windows 10 for free, Facebook is out of control, Tumblr lets users share in ad revenue, how lapsed gamers can lose their Gamertags, and if internet ads were aggressive... Read More , and the Anniversary Update has started rolling out Windows 10 Gets Anniversary Update, Instagram Launches Stories... [Tech News Digest] Windows 10 Gets Anniversary Update, Instagram Launches Stories... [Tech News Digest] Microsoft rolls out Windows 10 Anniversary Update, Instagram tells Stories, Time Warner buys into Hulu, Microsoft offers the HoloLens to everyone with money, and Grand Theft Auto IV cheat codes get mistaken for secret military... Read More to users around the world, Microsoft has focused one eye on the future. Windows 10 is, after all, the company’s final operating system, so it needs to evolve gradually as technologies emerge and fashions change. Microsoft isn’t yet ready to detail any of the features coming down the pike, but we expect the next big update, codenamed Redstone 2, to be released early in 2017. Redstone 3 will then follow in the second half of the year. Windows users should get used to thinking of Windows 10 as being in beta, forever. It’s never going to be “finished”, for want of a better word, which will take some getting used to, but it does at least mean it should always be getting better. At least in theory. There was once a time when new Apple hardware was kept firmly under wraps until the day it was unveiled on stage by an excited Steve Jobs. But Jobs is no longer with us, and neither is that level of secrecy surrounding Apple products. Now, we know exactly what’s coming down the line months before it’s officially announced. Take the iPhone 7, for example, which isn’t due to appear until at least September. And yet we already know everything we need to know about it. Bloomberg’s Mark Gurman, who has an enviable track record of leaking Apple news, has confirmed previous iPhone 7 rumors and added a new one pertaining to the Home button. Citing people who “didn’t want to be identified discussing unannounced features,” Gurman reveals three things about the iPhone 7. 1. The headphone jack is indeed disappearing Apple Ditches the Headphone Jack, Mark Zuckerberg Tapes Over Webcam... [Tech News Digest] Apple Ditches the Headphone Jack, Mark Zuckerberg Tapes Over Webcam... [Tech News Digest] Apple plans to kill the headphone jack, Mark Zuckerberg covers his webcam with tape, Twitter lets verified users Engage, Apple will fund your next eBook spending spree, and Jerry Seinfeld's apartment is Doomed. Read More . 2. The iPhone 7 will feature a dual camera system which allows for brighter, sharper pictures than anything that has come before. 3. The Home button will be pressure-sensitive, and offer haptic feedback to users. Assuming this information is correct and the sum total of the improvements made to the iPhone 7, it suggests a mixed bag for Apple fans. Removing the headphone jack is a cynical mistake, the pressure-sensitive Home button is a gimmick, and the dual camera system could be a game-changer. So, if you like taking photographs with your smartphone, the iPhone 7 could be perfect for you. BlackBerry has released its Hub+ suite of applications on Android. Hub+, which brings all your various communications together, was previously only available on BlackBerry 10 and the privacy-focused BlackBerry Priv Android handset Read BlackBerry Priv Reviews, Try Cortana for iPhone... [Digest] Read BlackBerry Priv Reviews, Try Cortana for iPhone... [Digest] See whether the BlackBerry Priv lives up to the hype, Cortana comes to the iPhone, Medium lets writers ignore readers, GOG launches its fall sale, and when Star Wars and Star Trek collide. Read More . However, it’s now available to anyone running Android 6.0 (Marshmallow). The BlackBerry Hub shows all of your email and social media notifications in one place, while the Calendar and Password Keeper do exactly what you would expect them to do. Hub+ (available on Google Play) is free for 30 days, at which point you can opt in to see ads or upgrade to the entire suite of apps for 99 cents-per-month. Spotify has launched a new feature called Release Radar, which, every Friday, will deliver a playlist of new music as curated by Spotify. Like Discover Weekly, one of Spotify’s previous automagic playlists Discover New Music with Spotify's Automagic Playlists Discover New Music with Spotify's Automagic Playlists Spotify has recently released several new ways of generating unique playlists that will help you discover awesome new music. We're here to guide you through these automagic playlist makers. Read More , Release Radar will be geared to each individual user, and no two playlists will be the same. Spotify Release Radar is ?? With Release Radar, Spotify will recommend two hours of new music every week. Your selection of songs, as sourced from music released in the previous six months, will be chosen based on the artists and genres you listen to on Spotify. This means the more you listen, the better Spotify will get to know your likes and dislikes. And finally, with all of the various ways of watching movies we now have at our disposal, it’s easy to forget that until just a few years many of us were renting videos from a retail unit located a few miles away. Blockbuster only went out of business in 2013, but its time on top feels like a lifetime ago. With that in mind it’s no wonder young kids really have no idea what Blockbuster was, or understand why we put up with such a ridiculous system for so long. As this Kids React video from the Fine Bros. shows. The thing is, kids, Blockbuster was all we had, and it worked perfectly well for us for a long time. Sure, Netflix produces amazing original content 13 New Netflix Originals You'll Be Watching in 2016 13 New Netflix Originals You'll Be Watching in 2016 Netflix has released a lot of original content -- including House of Cards, Orange Is the New Black, Narcos, and Master of None -- but 2016 is slated to be Netflix's most exciting year yet. Read More , Amazon Prime lets you watch content offline How to Download Amazon Prime Videos to Watch Offline How to Download Amazon Prime Videos to Watch Offline Amazon Prime Video lets you download movies and TV shows to watch offline for free. Here's how to download Amazon Prime videos. Read More , and Hulu hosts some unmissable TV shows 16 Unmissable TV Shows You Should Watch on Hulu Right Now 16 Unmissable TV Shows You Should Watch on Hulu Right Now Netflix, Amazon are the current kings of online streaming. However, it would be a mistake to dismiss Hulu out of hand, as it hosts a number of truly unmissable TV shows. Shows like these... Read More , but we didn’t know any better 10 years ago, OK?! 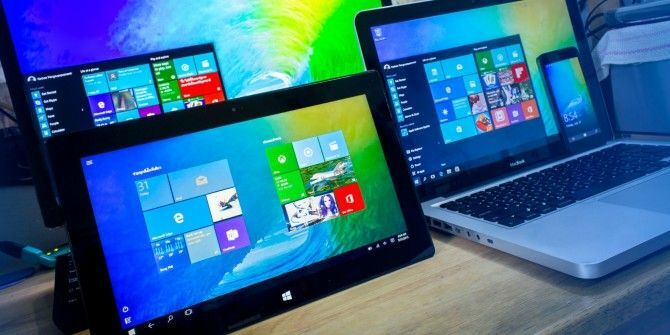 Are you looking forward to Windows 10 getting better and better? How do you feel about the planned changes coming to the iPhone 7? Will you be downloading BlackBerry’s Hub+ apps? How are you finding Spotify’s Release Radar recommendations? Do you miss renting movies from your local Blockbuster? Why do the writers in this site and many more keep calling Windows 10 a perpetual beta? To me beta used to sound like a really scary thing and I always avoided anything that was beta. This could have dettered some users from upgrading. I would compare Windows 10 with a part rolling release OS, because you can always update to the newest kernel. It would be nice if you called Windows 10 like that, it doesn't sound as bad as perpetual beta. Agree with Jimis2001. Windows 10 and newer Windows OS is now a WaaS (Windows as a Service) model. Which means always upgrading.